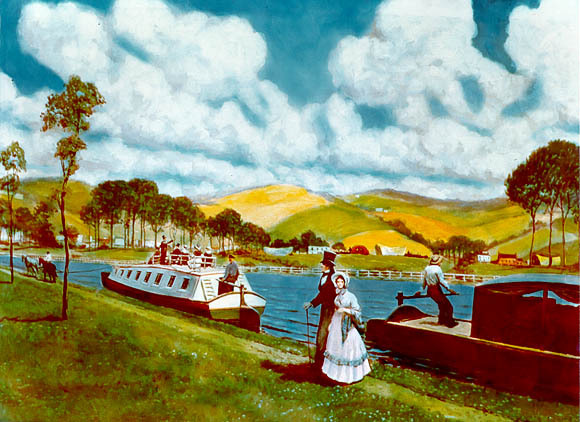 This painting shows the "Seneca Chief," the flagship of a flotilla making the maiden voyage down the Erie Canal. The 363-mile-long, $7 million canal opened the shortest thoroughfare between the Atlantic Coast's factories and the natural bounty of the Great Lakes, helping to position New York City as America's leading metropolis. The Canal did not greatly affect business for stagecoach companies, which were faster, and not limited by road capacity or ice, but it did bankrupt the Conestoga wagon freight carriers. By 1841, however, the railroads had put stagecoach companies out of business. The Erie Canal still operates today.